Enjoy vintage Americana while relaxing at the "Best Beach for Families"
Hollywood Beach was made for a glamorous South Florida vacation. 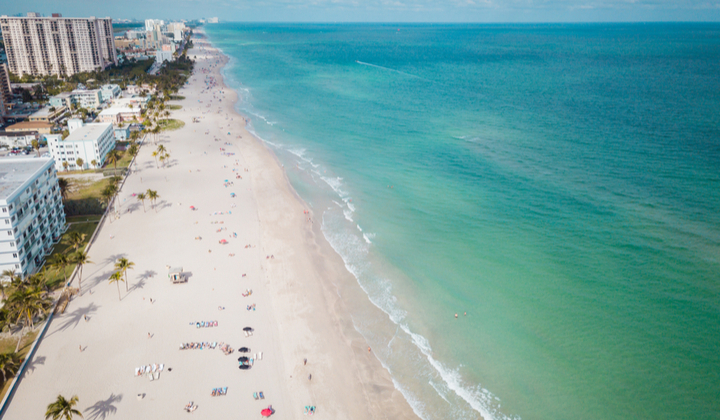 Nestled between Fort Lauderdale and Miami, this classic beachtown enchants visitors with its one-of-a-kind Broadwalk - yes, Broad-walk - that stretches nearly 2½ miles along the Atlantic coast. This brick paved thoroughfare is a haven for joggers, bicyclists, rollerbladers and anyone who enjoys spending sunny afternoons at one of the countless eateries and cafés along the way. Take the retro-style trolley to renowned burger joint Le Tub, boutique mom and pop shops, and many other attractions on the beach and downtown, including the Garfield Street paddle ball courts and a whimsical dolphin play fountain. Nearby, there is also the Anne Kolb Nature Center and Arts and Culture Center of Hollywood which hosts contemporary exhibitions and live stage performances, but most days are meant to be spent at the famed beach, known for its cleanliness and vintage family feel making it Fodor's "Best Beach for Families." What to buy: While there are tons of shopping opportunities, from chain oulets to mom and pop shops, you should definitely pick up a postcard or two along the broadwalk to commemorate your time here.